I like to think of the Star Wars films as silent movies, movies whose stories are carried forward visually and by a musical score. It took the musical genius of John Williams to fully realize this vision. His brilliant scores brought the original trilogy to life beyond my wildest dreams. 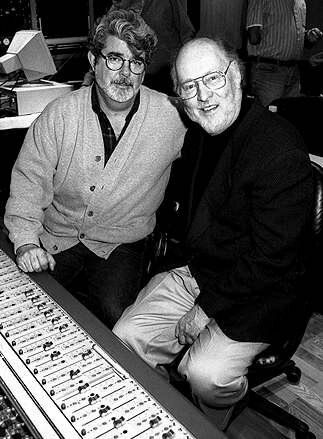 But John's astounding success made composing the score for Episode I a daunting task. Gone were so many of the characters and situations that his music now indelibly evokes. In Episode I, there is no Luke Skywalker, no Princess Leia, no Han Solo, no evil Empire, and even Darth Vader is an innocent little boy. John had to draw upon the signature themes while creating a new, if somehow familiar, musical galaxy. And he had to visit new emotional territory in Episode I. His music had to help tell the story of a pacifist Queen who confronts the need to fight for the survival of her people, a mother who must give up her son so that he might achieve his true potential, and noble Jedi faced with the rise of an unimaginable evil. Once again, John has exceeded my expectations and produced a lavish, rich, moving and thrilling score. Every fan of Star Wars - and of great music - is in his debt. While recently recording the music for Star Wars Episode I: The Phantom Menace with the London Symphony Orchestra, I was delighted to see that there were a dozen or so members of the orchestra who had played on the original 1977 soundtrack. During our first intermission, several of the younger players approached me and explained that, as children, they had seen and heard Star Wars, and immediately resolved to study music with the goal of playing with the London Symphony. As you can imagine, hearing this thrilled me since I had frequently noticed how many six-year-olds in our own country, who, not even having been born at the time of the original Star Wars movies, nevertheless know the story, characters and music of all three earlier films. George Lucas seems to have created a truly trans-generational phenomenon. He has in fact created a mythological world full of tall tales, magical creatures and exotic places that has taken a permanent place in the popular culture of the entire world, and it is my continuing great privilege to accompany him on his uniquely creative journey.